The integration of photovoltaics into laminated safety glass technology facilitates development of a unique, multi-functional energy symbiosis: electricity production, shading, light control, thermal insulation and facade design interwoven in an ingenious union! 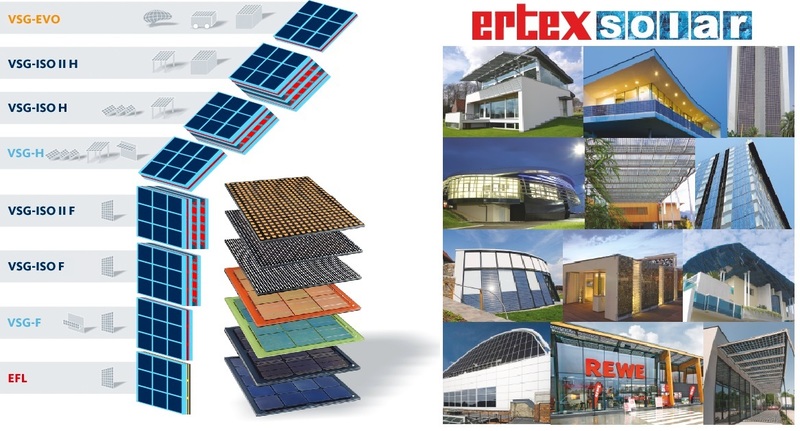 Ertex Solar offer to all architects, façade constructers and building owners limitless architectural design possibilities for the integration of photovoltaics into building structures. With individually produced, custom-made photovoltaic modules in laminated safety glass from ertex-solar, creativity is barely confined. XL-size photovoltaics and an almost inexhaustible variety of shapes and surfaces, allow the precise creative freedom that today’s architects require. These three basic technologies can now be perfectly combined with a variety of module shapes – polygons, circles and segments, ellipses, flat, curved, etc. and in addition, a range of different degrees of transparency, surface and module colours!